When I was scrolling down on my pc I found a very old pic from 2011 from my other blog. Then I posted each week a “my pretty life” article. So I thought why not do this again? Because this way you can get to know me a bit better! But because my life is not that interesting I decided to place a “my life” article once in the two weeks on Monday. I hope that you will love such articles, and that you will get to know me a bit better this way! Sunday I had to bring my boyfriend to his work because he needed to do somethings because he had a work accident…..
Oh, and do you know that a couple of years ago I walked with the carnival parade. The theme was about chickens so I was dressed like a chicken, haha good memories! And during carnival there is always a fair. And this time was the fair very small, but I couldn’t resist it and I wanted to play this game. It was almost 6 years or longer since I did this. So it was fun to do this again! On Tuesday it’s movie day if you are customer by orange. My boyfriend and I get each month a free ticket to go to a movie. And if there is one thing that I love then it’s going to the movies! This time we saw “black panther”. And wow, this movie is surpring good for sure a must see! I needed to go to Antwerp. But Antwerp city is a real mess right now… So I tried out the water bus. This is so handy and quick to get in Antwerp city! And the inside of the water bus looks a lot like the ones from in Venice. I really felt like a tourist ! And why I needed to be in Antwerp was for the mnm let’s get digital event. I had signed me up for the workshop digital music, but this wasn’t a huge success. The workshop normally started on 14h and it was getting later and later. And finally around 14h40 a second participant was there! The one that would give the workshop still wanted to wait till 15h. I know that he wanted to give everybody a change, but if you are already waiting for that long than you now that nobody else will come… But for the rest was it an interesting workshop! Because I live in a dangerous aria I was required to have iodine tablets at home. So when I could get them I directly got them because otherwise I would forget it! And once again I had a urinary infection and also an inflamed knee. So I can’t sport for a while. But to light the pain I made a delicious veggie burger! The day before yesterday I had a challenging casting in Mechelen. And today I will know or I’m selected or not… So I still need to wait tension, but the casting was so cool to do! And after the casting I had this smile onto my face, because from Mechelen we needed to go to Antwerp…. For the Antwerp wine festival! This was for sure worth it! I really love wine and this way I could taste so many wines from different countries. 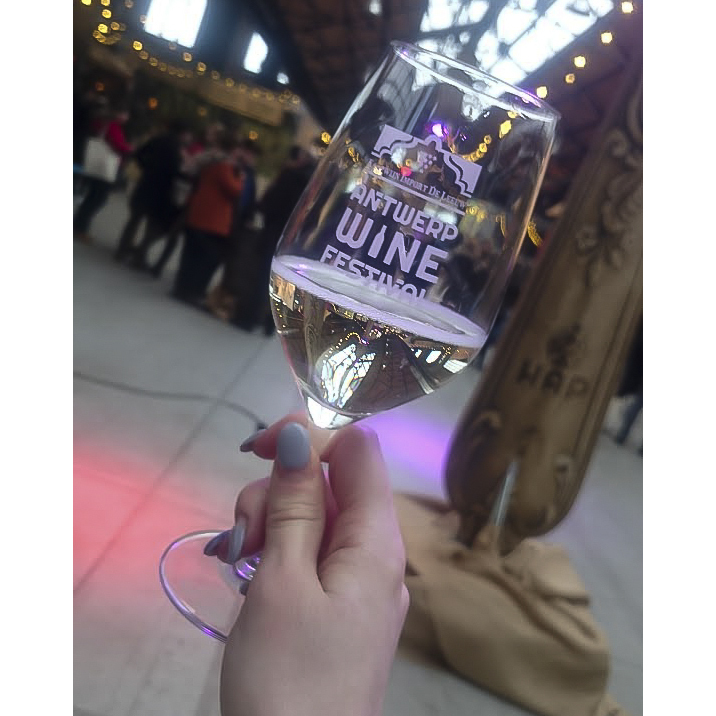 So the Antwerp wine festival is for sure worth it if you are a true wine lover! I hope that this week will be amazing for you! And that you love to see such articles, because from now on each two weeks on Monday a new my life article will come online! Hehe, ja bij mij ook! #goodmemories!